[ 'Jimmy Lynton' (Charles Parsons), actor-manager, grandfather of Tony Blair. ] 34 Typed Letters and 14 Typed Cards (thirty-two signed), to theatrical bookseller Barry Duncan, on his life story, theatre history, etc. With copies of Duncan's letters. All correspondence from 20 The Common, Ealing, W5 [ London ]. Between 1956 and 1969. Duncan's letters from London and Southampton. 34 Typed Letters (25 signed) and 14 Typed Cards (6 signed). Most of the 31 signatures 'Jimmy', but a few signed 'Jimmy Lynton' and 'Jimmy L.' The collection in good condition, lightly aged and worn. Long gossippy letters, mainly comprising theatrical reminiscence, often with reference to his regular column in 'The World's Fair, called 'P & Fs'. Also present are 37 carbon copies of letters to Lynton from Duncan, covering the same date range, also filled with theatrical information (Duncan was also a theatre historian and author of a book on the St James' Theatre). [Printed pamphlet.] Report on the Census of Young Employees, between 14 and 18 years of age, in the County of London, on June 30th, 1920. [London County Council, Education Committee; I.C.C. Education Offices, Victoria Embankment, W.C. 19 November 1920.] Printed on '18-3-21 [i.e. 18 March 1921]'. 16pp., foolscap 8vo. With four plates, each carrying a map of the County of London (two of them preceding the title) and 2pp of tables on a fold-out leaf. In poor condition, on aged and worn paper, with closed tears, and lacking orange wraps (which presumably carry the full title-page), traces of which are still present. Stamp and shelfmark of the Board of Education Library, London. No copy traced on COPAC or OCLC WorldCat. [James Smith.] Two Autograph Letters Signed (both 'Ja Smith'), the first headed 'Note for Alexr. Blair Esqr. Treasurer of the Bank of Scotland', and docketted 'Report on City [of Edinburgh] Improvements'. First Letter: No place. 25 July 1837. Second Letter: Edinburgh. 31 July 1837. Both 1p., foolscap 8vo, and disbound. Both in good condition, on aged paper, with loss at edge from disbinding, causing slight loss of text in second letter. Letter One: Docketed on reverse of second leaf 'James Smith | July 25 1837 | Report on City Improvements.' 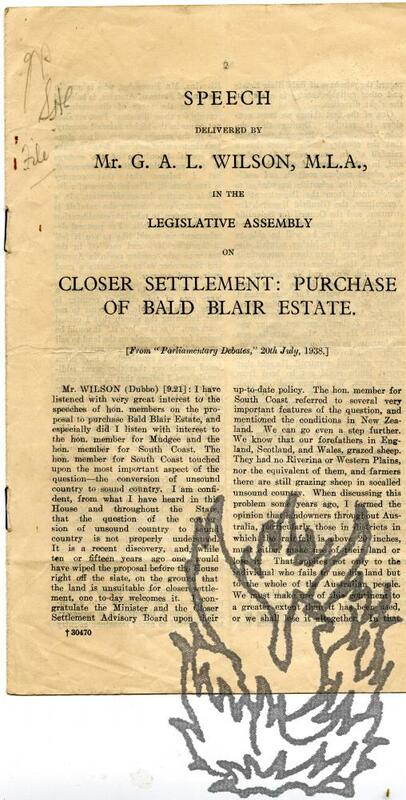 The document begins: 'Having carefully examined the state No. IV. made up by the Improvement Commissioners, and submitted to the Bank of Scotland &c, and also, inspected the works with Mr Geo. Smith Architect for the Commissioners, I take leave to submit the following observations thereon'. Autograph Note in the third person from Richard Plantagenet Temple-Nugent-Brydges-Chandos-Grenville, 2nd Duke of Buckingham and Chandos, to 'Mr Blair', regarding a pass to the 'House of Peers' [House of Lords] and a 'Pamphlet on the Corn Laws'. 17 May [without year, but on paper watermarked 1839]. 1p., 12mo. Fair, on lightly-aged paper, with a creased corner. The note reads: 'The Duke of Buckingham and Chandos incloses [sic] an order for Mr Blair to the House of Peers for to-day, & begs to acknowledge the receipt of the Pamphlet on the Corn Laws. | 17th May'. The paper is watermarked '<...>YNSON | 1839'. Sydney: David Harold Paisley, Government Printer - 1938. 8vo: 6 pp. Stapled pamphlet. Text clear and complete. On aged and creased paper. 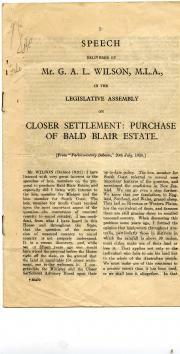 For Wilson 'the most important aspect of the question' is 'the conversion of unsound country to sound country [...] It is a recent discovery, and, while ten or fifteen years ago one would have wiped the proposal before the House right off the slate, on the ground that the land is unsuitable for closer settlement, one to-day welcomes it.' Red-ink 1 cm accession stamp of the Webster Collection on reverse of blank final leaf, numbered 4188. No copy in the British Library, on COPAC, or on WorldCat.